A striking example of the accuracy of the new method happened in the winter of 2013. 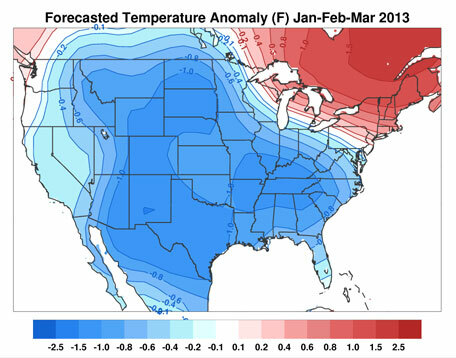 Based on extensive Siberian snow cover during the fall, the researchers correctly forecasted cold weather for much of the U.S., while most other forecasters predicted warm weather for the U.S. For a comparison between predicted and observed temperature anomalies, please see the following images: forecast temperature anomaly Jan-Feb-Mar 2013 and observed temperature anomaly Jan-Feb-Mar 2013, U.S. only. Similarly, the scientists� forecast for the winter of 2011-12 predicted warm conditions in the Eastern U.S., while other forecasts anticipated an equal chance of warm, cold or normal weather. Snow cover has a pronounced impact on large-scale waves in the atmosphere, so the advantage of factoring in snow cover to improve winter forecasts is not limited to the United States. For the winter of 2010-11, the scientists issued a real-time winter forecast for Europe that was compared with those issued by European forecast centers. The departure from normal temperatures forecast for the entire Northern Hemisphere was compared to the observed departure from normal temperatures. The forecast showed an almost exact correspondence to observed temperatures across most of the land areas of the Northern Hemisphere with the exception for the region near Mongolia. Regions affected by snow variability differ from those influenced by El Niño. The influence of snow cover extent has the potential to complement El Niño-derived forecasts, and to advance our understanding of climate variability and its application in prediction models. October is the month where snow cover undergoes its greatest expansion in the Eurasian region. During October, Eurasian snow cover can increase by as much as 10-15 million square kilometers, which is greater than the total land area of the United States, including Alaska. NSF-funded research has shown that variability in the extent of Eurasian snow cover can be used to predict cold or warm winters across the entire mid-latitudes of the Northern Hemisphere. The predicted winter surface temperature anomalies (differences from normal) for the United States Jan-Feb-Mar 2013 in degrees Celsius. The predictions make use of October Siberian snow cover, sea level pressure anomalies and equatorial Pacific sea surface temperature anomalies. 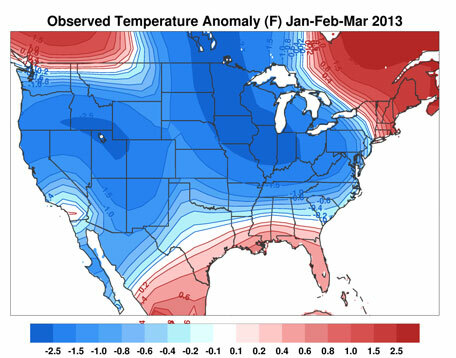 The verifying observed temperatures for the United States Jan-Feb-Mar 2013 in degrees Celsius. The large scale temperature pattern predicted for last winter was correctly predicted though observed temperatures were somewhat colder than predicted.